The window has been installed at the library.Â Should help get some of those drafts stopped.Â Thanks to all who participated in the Snow Pile contest and congratulations to Gary Haug who guessed the time within 1 hour and 37 minutes! The November 11th meeting, of the Library, was brought to order by our Vice President , MarshaÂ Engelken, the Secretary Marylyn Wenzl, read the minutes of the last meeting, they were read and approved. The Treasurer, Milton Anderson, gave his report and bills were submitted,Â and approved,Â a thank you was signed for Lyle Wenzl, he had made a storage cupboard for the bathroom, for our use until not needed, andÂ then it goes back to the family. Lyle also put up a grab bar, in the bathroom. Becky Shepherd attended our meeting via Web-Cam. Jannett Argo attended the meeting, she willÂ be a new board member, subjectÂ to the approval of the city council. Audrey readÂ to the Kinder-Prep, at the school house, October23rdÂ ,Â Jannett Argo read to the 3 year oldsÂ at the Library, Oct.Â 26th, Marylyn assistedÂ them. Audrey thanked the ones helping her when she needed off. Audrey explained the search engine webÂ sites. We discussedÂ the progress of bids on the storm door, two more will be contacted for bidsÂ for this and the window project. Audrey will collect the bids. Audrey will contact Doug Berkley and Jannett will contact Rick Argo. Ferrell Meritt attended the meeting and discussed the upper windows and the doors. The bids are to be in by December 1. Dorothy Tilley attended the meeting and stated she is setting up an account for the repair of the Depot as several has expressed an interest in preserving it, and she had a picture of her dad on the last run (of the train) in 1960, Audrey will make copies ofÂ these pictures. We discussed theÂ organization ofÂ the books, and we will continue at the next meeting. We discussed the Tech-Grant, Matthew and Audrey will apply for this grant. Audrey read a letter sheâ? ?d gotten from Canada, from a relative of Joe Rodgers, Audrey was going to send her some information. We discussed some fund raising ideas, Jannett, Marylyn, Audrey and Becky will be on the committee. With money from the same grant that was used to purchase the wireless router, the library also purchased a couple SanDisk m230 MP3 Players. This can be used to carry audiobooks and music with you wherever you go. It is sent out with headphones, as well as a cassette deck adapter, which allows you to play it through a cassette player. The sites below contain free audiobooks and music and have been bookmarked on the library computers. You will be responsible for replacing the battery when it wears out. It requires a single AAA battery. The MP3 player will be available for checkout in 2 week intervals. If you are going on a trip, it may be checked out for longer periods of time. 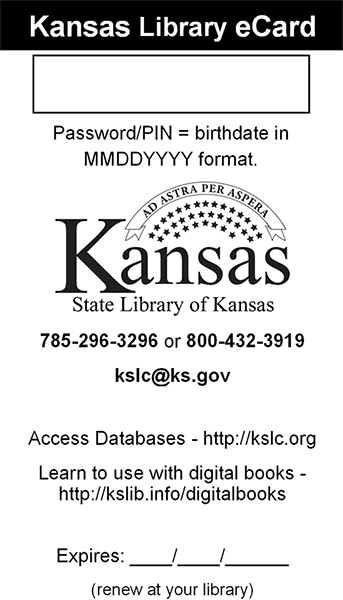 You may reserve it in advance by talking to a librarian. We now have a few new fantasy books available. The currently published portion of The Wheel of Time series by Robert Jordan is available. From a prequel to Book 11. Also the first four books in the Shannara series by Terry Brooks are available for checkout. If you enjoyed The Lord of the Rings, check these out. You may or may not be aware, that earlier in the year, the library purchased a new HP All-in-One Printer. It is capable of printing, copying, scanning, and faxing. In black and white or color and with single or double sided pages. We hope that this is found useful. The board has agreed to the use of a simplified pricing scheme to help pay for the cost of ink, phone line (when used for faxing), and maintenance for the printer. The cost will be 25Â¢ for each page printed and each page sent out as a fax. This includes pages that are black and white or color, single or double-sided, and faxes that are sent or received. There is a cover sheet available for faxes sent from the library and we ask that you fill out an entry on the Fax Record form. The author, Richard Gibbs, traces an 18 year old draftee during World War II through basic training, aerial gunnery school, marriage and eventually being assigned to the 457th Bomb Group as a participant in some of the greatest air battles of World War II. The book is written almost entirely from memories remembered from that time over 60 years ago. It tells of the great raids on Leipzig, Cologne, as well as those on the center of the City of Munich, Germany. Richard Gibbs attempts to describe his feelings when the Corporal walked down the gravel path toward his hut in the middle of the night to wake the crews who were to fly that day. Also, he describes the isolation feelings of the flying personnel while assigned to one of the greatest B17 Groups of the War. With some grant money that was recently received for some technology upgrades, the library purchased a wireless router. Between the times of 7:00 am 10:00 pm, free wireless internet access will be available at the library. Even if the library is closed. If your computer is equipped with a wireless card, you will be able to connect to the internet. No password is required. The library is not responsible for any information that is compromised by your use of the wireless connection. Technical support for connecting your computer to the internet cannot be provided by the library or the library staff. You are responsible the setup and configuration of your computer. Printing to the library printers is not allowed from computers connected wirelessly. You are expected to abide by the Electronic Equipment and Internet Use Agreement while using the wireless connection. While not required, the library would appreciate it if you would let us know if you make use of the wireless connection.